C. Bertolotto et Al., Valle di Susa. Tesori d’arte, Torino-Londra-Venezia-New York, Allemandi, 2005, pp. 182-183. The chapel was probably built between the late fifteenth and the early sixteenth century, then profoundly altered during the eighteenth century. 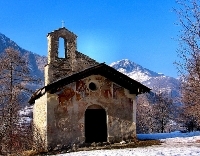 During recent restoration have emerged some fragments of frescoes coeval to the original building and attributed to the so-called Master of Savoulx, a painter trained in the circle of Serra di Pinerolo and also active in the parish of Savoulx and Rochemolles in the first decades of the sixteenth century.